WASHINGTON -- Republican leaders on Sunday grappled with the prospect that the best hope for stopping Donald Trump's march to the nomination may be Ted Cruz - the only candidate who causes as much heartburn among party elites as the billionaire businessman, if not sometimes more. The Texas senator split contests with Trump in Saturday's voting, bolstering his argument that only he can defeat the real estate mogul. Trump and Cruz are now significantly outpacing Marco Rubio in the delegate count, further shrinking the Florida senator's already narrow path to the nomination. If Rubio's slide continues, he would be the latest establishment candidate to fall victim to an angry, frustrated electorate that cares little about endorsements from party leaders or newspaper editorial boards. Rubio has rolled out both at warp speed in recent weeks, but his appeal with Republican voters is not keeping pace. 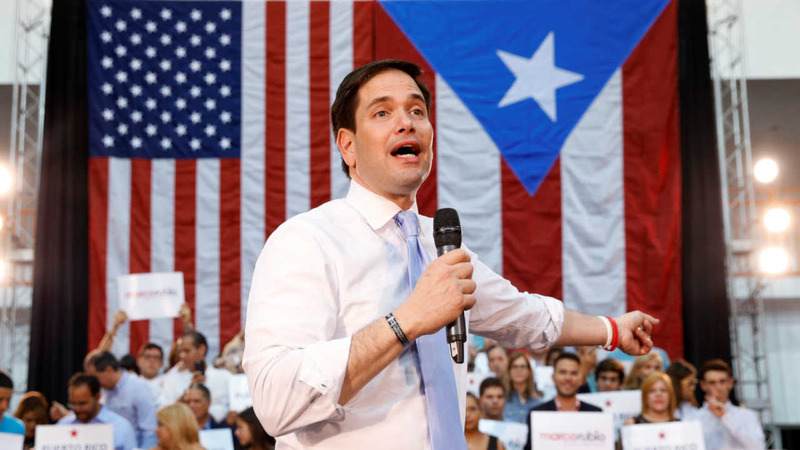 Rubio did pick up a victory Sunday in Puerto Rico's primary, his second win of the 2016 cycle. Democrats, meanwhile, held caucuses Sunday in Maine. Sanders won that contest, beating rival Hillary Clinton for his eighth win of the 19 contests already held in the nomination process. Also, Democrats were debating debate Sunday night in Flint, Michigan, highlighting differences on economic policy. The Democratic candidates were facing off just two days before Michigan's primary in a city that was already in tough shape long before residents learned their drinking water was tainted with lead. Clinton, a former secretary of state and senator, claims that only she has a "credible strategy" for raising wages. In recent days, she has laid out a plan for a "clawback" of tax benefits for companies that ship jobs overseas, using the money to encourage investment in the United States. Sanders wrote in Sunday's Detroit Free Press that his rival had supported "disastrous trade deals" such as the North American Free Trade Agreement and normalized trade relations with China that have resulted in thousands of job losses that devastated cities such as Detroit and Flint. Sanders won Democratic contests on Saturday in Kansas and Nebraska, but Clinton's overwhelming victory in Louisiana enabled her to add to her commanding lead in delegates to the party's national nominating convention. With 25 Maine delegates at stake, Sanders is assured of winning at least 14 while Clinton stands to gain at least six. But his victory won't have much impact on Clinton's substantial edge overall, thanks to her support among superdelegates - members of Congress, governors and party officials who can support the candidate of their choice. When including those party leaders, Clinton has at least 1,129 while Sanders has at least 498. It takes 2,383 delegates to win. In the Republican race, the wary interest in Cruz from more mainstream Republicans is the latest unexpected twist in a nominating contest where talk of a contested convention or third-party candidate is becoming commonplace. "If Ted's the alternative to Trump, he's at least a Republican and conservative," South Carolina Sen. Lindsey Graham said. While Graham made sure to note that it's "not like I prefer Ted Cruz," he encouraged Rubio and Ohio Gov. John Kasich to "decide among themselves" whether they can be a realistic alternative to Trump. Mitt Romney, the 2012 Republican presidential nominee, said Cruz is indeed "emerging" as the chief anti-Trump candidate. "I think a lot of people were surprised by how well Ted Cruz did," said Romney, who has thrust himself back into the political discussion with a searing takedown of Trump in a speech last week. Romney has stepped back into the spotlight at a moment of crisis and chaos for the Republican Party. Leaders in Washington who assumed hard-liners such as Cruz represented a minority view have been left wondering if they're the ones out of step with their party's base. For months, Republican elites have lumped Trump and Cruz together, arguing that neither could win in November's general election. Cruz is an uncompromising conservative who has publicly criticized party leaders, including Senate Majority Leader Mitch McConnell, for what he sees as a pattern of giving in too easily to President Barack Obama. Cruz particularly angered Senate leaders when he helped orchestrate the 2013 government shutdown, which failed in achieving the senator's stated goal of defunding Obama's health care reform law. But Cruz has built a loyal following among conservatives and evangelical Christians. After winning the leadoff Iowa caucuses, he's also beaten Trump in five more states, more than any other candidate. Trump still leads the field with at least 378 delegates, while Cruz has at least 295. Rubio and Kasich lag far behind in the race to reach the 1,237 delegates needed to clinch the Republican nomination. Rubio and Kasich desperately need to win in their home states of Florida and Ohio on March 15 to have any credible case for staying in the race. Trump's lead has sparked a flurry of discussions among Republicans about complicated long-shot options to stop him. Rival campaigns are exploring ways to prevent Trump from getting the delegates he needs to win the nomination outright, then defeat him at the convention in July. A small, but influential, group of Republicans has raised the idea of backing a yet-to-be-determined third-party candidate. Trump has warned Republicans that they'll lose his voters if they try to take the nomination away from him. "We have a tremendous number of people coming in and a tremendous number of people showing up to vote," he said Sunday. Graham and Romney spoke on NBC's "Meet The Press." Trump appeared on CBS' "Face The Nation."